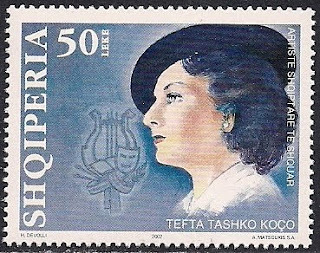 Tefta Tashko Koco(1910-1947), Albanian singer, she learned to sing at the Montpellier Conservatoire and then at Paris Conservatory. Returning to Albania in 1936 where she performed in operatic and Albanian folk songs. She sang especially written for her from Albanian composer Kristo Kono.